Flovent is an inhaled steroid used as a controller medication in the treatment of asthma. This and other inhaled steroids are the recommended first treatment if you need more than a rescue inhaler for your asthma. Inhaled steroids are essential in maintaining good asthma control. Flovent decreases inflammation by acting directly on the airways when inhaled into the lungs. Additionally, Flovent decreases airway hyper-responsiveness, which will make your airways less likely to strongly respond to an asthma trigger. The end result of decreased inflammation, mucus production, and hyperresponsiveness is a decrease in wheezing, chest tightness, shortness of breath, and coughing. 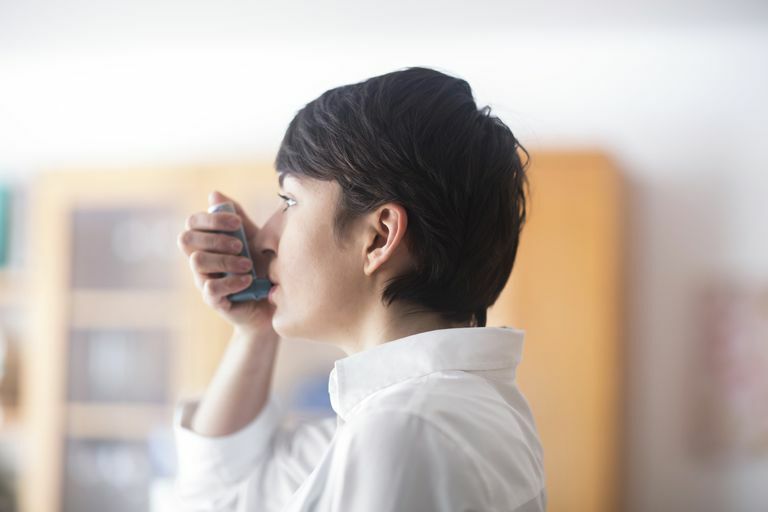 Unlike your quick-relief medications like a short-acting beta agonist, Flovent is used to control chronic asthma symptoms and needs to be taken daily. Flovent is prescribed as an aerosol in a metered dose inhaler. It is also available in several different strengths. Generally, you will take 1 to 2 puffs twice per day. Flovent needs to be taken daily no matter how well your asthma symptoms are controlled. If you feel your asthma is really well controlled, you can talk with your doctor about decreasing the strength of your dose. The active component in Flovent, fluticasone propionate, is also contained in Cutivate for the treatment of skin conditions and in Veramyst used in the treatment of nasal allergies. The most important factor in utilizing Flovent to improve your asthma symptoms is taking it correctly. Only 70 percent of asthmatics take their inhaled steroids as directed by their physicians. Using Flovent only when you are experiencing asthma symptoms is not a good way to control your asthma and may even be dangerous. Using Flovent with a spacer not only can increase the amount of medication that gets to your lungs, but also helps decrease side effects. If you do not want to use a spacer, it is very important to learn how to use an MDI appropriately. National Heart, Lung, and Blood Institute. Expert Panel Report 3 (EPR3): Guidelines for the Diagnosis and Management of Asthma. August 2007.